While Tide had nothing to do with this trend, they did manage to gracefully avert the crisis around their brand. 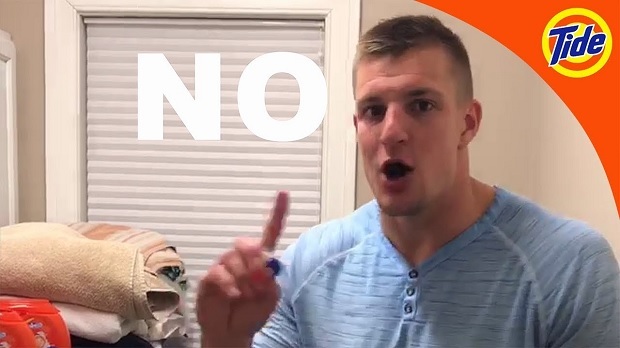 They did so by tackling the issue head on, first telling challenges to call poison control and then by sharing this hilarious video on Twitter featuring the famous US football player Robert “Gronk” Gronkowski, a suitable role model to get the message through to peer-pressured teens. At the time of his 21-second PSA, the Tide Pod Challenge was in full swing. There were jokes about Tide Pod Hot Pockets, Tide Pod pizza, and The Onion’s Sour Apple flavored Tide Pods. There was even a spike in detergent poisoned teens. Swallowing the detergent could result in a life-threatening situation, and that even putting a small amount in your mouth and spitting it out can cause diarrhea, vomiting or breathing difficulties.